The proportion of patients with heart failure with preserved ejection fraction (HFPEF), compared with those with reduced ejection fraction (HFREF), is significant and rising. Studies have used an ejection fraction (EF) >50% as the sole criteria for identifying patients with HFPEF. However, European Society of Cardiology (ESC) guidelines include the diagnostic criteria of EF >50% and evidence of diastolic dysfunction. In this retrospective cohort study based on admissions in 2012; we compared characteristics, treatment and outcomes between HFPEF and HFREF patients. One year readmission and survival rate was also assessed. Overall, 41 (17%) patients had HFPEF (EF >50% and either medial or lateral E/E’ >15) compared with 200 (83%) with HFREF. Age was similar between the two groups (HFPEF: 84 ± 9 vs. HFREF: 82 ± 14, p=0.106). HFPEF patients were significantly more likely to be female (71% vs. 41.5%, p=0.001) and significantly less likely to have ischaemic heart disease (34% vs. 52%, p=0.043). Patients with HFPEF were significantly less likely to be taking loop diuretics, potassium-sparing diuretics, angiotensin-converting enzyme (ACE) inhibitors and aspirin on discharge. Ischaemic heart disease was a significant predictor of mortality in HFPEF patients (hazard ratio [HR] 7.14; 95% confidence interval [CI] 1.51–33.85, p=0.01). There was no difference in readmission and one-year survival rate (p=0.68 and p=0.551, respectively). In conclusion, HFPEF patients are more likely to be female but less likely to have an ischaemic aetiology. There were significant differences in treatment of both phenotypes. Both groups have a similar poor prognosis. It is estimated that the proportion of patients with heart failure with preserved ejection fraction (HFPEF) is between 30% and 50%.4-9 As a result, in recent years, more attention has been paid to this cohort of patients. However, there is still limited information regarding outcomes and treatment for these patients. Most previous studies have based their inclusion criteria on ejection fraction (EF) alone. However, the European Society of Cardiology (ESC) guidelines for the diagnosis of HFPEF advocate different criteria: signs and symptoms of heart failure, an EF of more than 50%, relevant structural heart disease and/or evidence of diastolic dysfunction on echocardiography.14,15 To our knowledge, there has not been a previous study comparing outcomes between patients with HFPEF and HFREF based on these guidelines in Northern Europe. The main aim of our study was to assess the characteristics, treatment and short-term outcome of patients with HFPEF following admission with acute decompensated heart failure compared with those patients with HFREF. Our secondary aim was to evaluate predictors of outcome in these patients. To our knowledge, this is the first analysis of this cohort of patients in Northern Europe and in a district general hospital setting. This was a retrospective cohort study. Between 1 January 2012 and 31 December 2012, we identified all patients with a primary discharge diagnosis of heart failure who were admitted to Southend University Hospital NHS Foundation Trust, UK. The diagnosis of heart failure was initially made by the admitting medical team. Outcomes were obtained by reviewing all discharge letters including medication, chest X-rays and echocardiograms. Where there were missing data, patients’ notes were reviewed. Patients who, on reading their discharge letter, did not have diagnosis of heart failure, were excluded. Echocardiography reports were used for analysis if they had been performed within six months before or after the patient’s admission date. Patients were also excluded from analysis if left ventricular ejection fraction (LVEF) had not been evaluated by echocardiography or if they had severe valvular heart disease. Patients were subdivided into two groups, those with reduced EF and preserved EF. Outcome variables obtained from echocardiography were the presence of pulmonary hypertension, severe valvular heart disease, EF and medial and lateral E/E’. E/E’ ratio was retrospectively calculated in patients who had tissue doppler imaging but initially did not have an E/E’ ratio calculated. Patients with reduced EF were defined as either having a qualitative report of decreased EF or a LVEF less than 50%. Preserved EF patients were defined as having a LVEF more than 50% plus a medial or lateral E/E’ ratio more than 15. Baseline measurements included age, gender and hospital duration. Patients’ symptoms on admission, including shortness of breath and peripheral oedema, were obtained from discharge summaries. We also obtained patient comorbidities and medication from discharge summaries. The presence of heart failure on admission chest X-rays was obtained from X-ray reports. Where data were missing from discharge summaries these data were collected from patients’ notes. Clinical outcomes including readmission to hospital with heart failure and inpatient mortality were recorded using the hospital’s local database. One-year mortality rate was also recorded. The Shapiro-Wilk test was used to check for normality of distribution for continuous variables. Non-normally distributed data (age and hospital duration) are reported as median (± interquartile range [IQR]). Categorical variables are reported as frequency (%). The Mann-Whitney U-test and Chi-square test were used to examine continuous and categorical outcomes, respectively, between patients with reduced and those with preserved EF. A Kaplan-Meier curve was constructed to analyse one-year mortality. The log-rank test was used to determine differences in mortality between the two groups. Multi-variate Cox-regression analysis was used to evaluate the effect of independent variables on survival in each group (reduced vs. preserved EF). Variables included age, gender, diabetes, hypertension, ischaemic heart disease, atrial fibrillation and chronic obstructive pulmonary disease (COPD). A p value of less than 0.05 was taken to be statistically significant. All data were analysed using SPSS version 22. This was a retrospective audit of data and, therefore, did not require ethics approval.16 The study was registered with the local research and audit department (Southend University Hospital NHS Foundation Trust, UK). In 2012, there were 668 admissions with a definitive diagnosis of heart failure. There were 113 excluded from the analysis as they had not had a recent echocardiogram. In addition, 83 patients were excluded as they had severe valvular heart disease. Of the remaining admissions, 97 were readmissions leaving 375 patients admitted with heart failure. Of these patients, 200 had a reduced EF, 81 patients had preserved EF but no assessment of E/E’, 53 patients had preserved EF and a medial or lateral E/E’ of no more than 15 (42/53 patients had a medial and/or lateral E/E’ between 8 and 15) and, finally, 41 patients had a preserved EF plus a medial and/or lateral E/E’ of more than 15. Thus, a total of 241 patients were included for analysis. A total of 200 (83%) patients had a reduced EF compared with 41 (17%) who had preserved EF. Table 1 outlines the baseline characteristics of each group. Patients in the reduced EF group were significantly more likely to be male. Both groups had similar signs and symptoms to each other. Patients with reduced EF were significantly more likely to have a history of ischaemic heart disease, however, patients with preserved EF were significantly more likely to have chronic kidney disease. The median hospital duration was nine (± 10.8) and seven (± 8) days for patients with reduced and preserved EF, respectively. The distribution of hospital duration was similar across both groups (p=0.397). In the 12 months after discharge, 53 patients with HFREF (27%) and eight patients (20%) with HFPEF were readmitted with an exacerbation of heart failure. There was no significant difference in the readmission rate one year after discharge between each group (p=0.68). Twenty-four patients (12%) with reduced EF died while an inpatient, whereas four patients (10%) with preserved EF died while an inpatient (p=0.683). Sixty-three patients (32%) with reduced EF and 11 patients (27%) with preserved EF died within one year of admission. Survival was similar between the two groups (log-rank p=0.551) (figure 1). Predictors of mortality in patients with reduced and preserved EF are shown in table 2. Age and history of ischaemic heart disease were significant predictors of survival in patients with reduced and preserved EF, respectively. Twenty-eight patients were excluded from the medication analysis as they had died as an inpatient. A further two patients were excluded as their medications were not available. Both of these patients were in the reduced EF group. Patients with reduced EF were significantly more likely to be taking loop diuretics, potassium-sparing diuretics, angiotensin-converting enzyme (ACE) inhibitors and aspirin. Patients with preserved EF were significantly more likely to be taking warfarin, calcium-channel blockers and thiazide diuretics. There were similarities and differences between the two groups. Although there were similar rates of hypertension, hypercholesterolaemia, atrial fibrillation, diabetes, cerebrovascular accident (CVA), peripheral vascular disease, COPD and dementia; patients with preserved EF were significantly less likely to have an ischaemic aetiology as a cause of their heart failure, however, ischaemic heart disease was a significant predictor of mortality in this group. 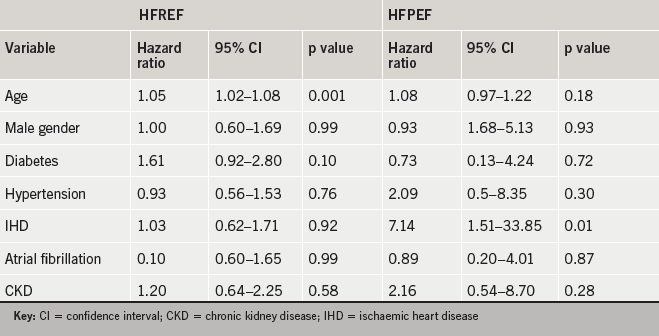 Patients with HFPEF were significantly more likely to have chronic kidney disease (CKD). This is similar to previous studies: 31%, 49% and 35% of patients in the I-PRESERVE (irbesartan in heart failure with preserved systolic function), DIG-PEF (Digitalis Investigation Group: Preserved Ejection Fraction) and CHARM-preserved (Candesartan in Heart Failure: Assessment of Reduction in Mortality and Morbidity: Preserved) studies had CKD.22 However, our study did not have a strict definition for CKD, although there is no reason that comorbidities were not accurately documented on the discharge letters. Our study did not investigate whether there were differences in stages of CKD between the two groups. Our study included patients with either a medial or lateral E/E’ ratio more than 15, as previous studies have found both to be predictive of diastolic dysfunction and more accurate than taking an average. Ommen et al. showed the medial E/E’ ratio had a better correlation with mean left ventricular diastolic pressure (M-LVDP) than a lateral and average E/E’ ratio.27 Whereas, Shuai et al. showed that a lateral E/E’ yielded greater diagnostic accuracy than either septal or a mean E/E’ ratio.28 The EURO-FILLING (European multicentre validation study of the accuracy of E/E’ ratio in estimating invasive left ventricular filling pressure) study is expected to provide more information and contribute to the standardisation of the assessment of HFPEF in clinical practice. The efficacy of aldosterone antagonist therapy in patients with HFPEF is uncertain, given the results of the Treatment of Preserved Cardiac Function Heart Failure with an Aldosterone Antagonist (TOPCAT) trial.31 The trial randomly assigned 3,445 patients with symptomatic heart failure and LVEF ≥45% to receive either spironolactone or placebo. The trial showed no reduction in the composite primary outcome (death from cardiovascular causes, aborted cardiac arrest, or hospitalisation for HF) from spironolactone therapy. However, subgroup analyses suggested regional heterogeneity in patient populations and possible benefit from spironolactone therapy in a subset of patients with a diagnosis of heart failure confirmed by elevated B-type natriuretic protein (BNP) or N-terminal (NT)-proBNP levels. Our study showed that patients with preserved EF received significantly less ACE inhibitors, loop diuretic and potassium-sparing diuretics than patients with reduced EF. This is similar to previous studies.4,12,31 Patients with HFPEF were significantly more likely to be taking warfarin. This is surprising, as more patients with reduced EF had atrial fibrillation. There may be other factors responsible for this result, e.g. bleeding risk. In our institution, patients with HFREF are referred to the community heart failure team for further management, whereas, as yet, HFPEF patients are not. There is scope to include HFPEF patients within the specialist heart failure team. Our study showed that there was also no significant difference in the hospital readmission rate between patients with preserved and reduced EF. 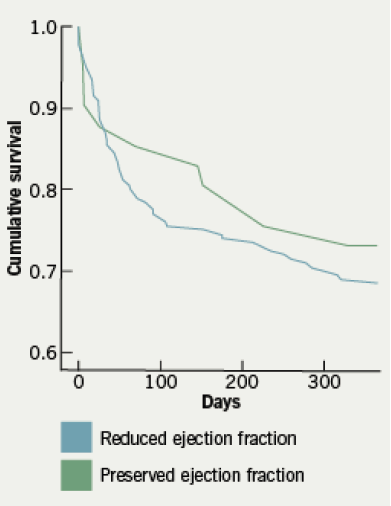 The one-year survival rate was better for patients with preserved EF, although this was not statistically significant. Our results are in agreement with some,4,12,32,33 but not all previous reports. Lenzen et al. reported that patients with systolic dysfunction had a significantly higher mortality than patients with preserved EF.9 The differences in results observed may be due to the different criteria for diagnosing HFPEF. We used an EF >50% and evidence of diastolic dysfunction, whereas Lenzen et al. used 40%. In addition, we checked for one-year survival, whereas Lenzen et al. had a shorter follow-up of 12 weeks.9 Our findings confirm the need for more trials to improve the prognosis of patients with HFPEF. As with any retrospective study, there are also limitations in our study. First, there were only 241 patients admitted with heart failure within our period of study. This is fewer than previous studies and, therefore, raises the possibility of type two statistical errors occurring in both groups. In addition, 81 patients were excluded from the audit, as they did not have an assessment of E/E’. Also, 42 patients had a medial and/or lateral E/E’ between 8 and 15. It is likely more patients would have met the ESC definition for HFPEF if NT-proBNP or BNP levels were assessed in addition to left ventricular mass index and left atrial volume index.14,15 It is possible that we have underestimated the incidence of HFPEF. In our study, the degree of left ventricular systolic dysfunction, i.e. mild, moderate or severe, was not taken into account in patients with HFREF, which makes it hard to accurately compare the outcomes, based purely on preserved or reduced EF. In addition, as with previous articles, the differences in definitions for HFPEF makes it difficult to directly compare our results with previous studies. Finally, there is the possibility of further underestimating the number of patients who had HFPEF. We included patients who had a definitive diagnosis of heart failure on discharge, however, it is possible that some patients were not diagnosed with heart failure once it was known they did not have reduced EF on echocardiography. This may particularly be true for patients not admitted to a cardiology ward. In conclusion, our study confirms previous findings regarding patients with preserved EF, but also provides new information. Our study showed that patients with heart failure are older than previously thought, this is true for patients with reduced and preserved EF. Patients with preserved EF were less likely to have ischaemic aetiology. There was no difference in the readmission and survival rate between patients with preserved and reduced EF. The prognosis of heart failure with preserved EF is poor; more larger cohort studies are needed to better understand these patients, especially in older populations. More randomised-controlled trials are needed to improve treatment modalities for these patients. If you would like to learn more about heart failure and earn CPD points at the same time, click here to visit our modular BJC Learning programme on this topic.